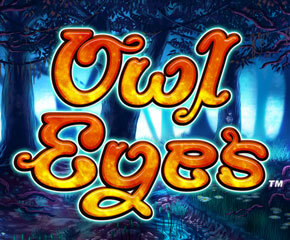 Owl Eyes slots is a game developed by NextGen. This slot has 5 reels and 50 paylines. The reels feature a backdrop of the nightlife in a forest brightened by moonlight & filled with fireflies and woodland critters which make it magical. The beautiful trees seem to come alive in this slot. This slot suits the collection of slots at NextGen well enough. The value of coin denomination ranges from 0.01 to 2.00. “Up/Down Arrows” are used for setting up the lines. Gamble feature can be activated by “Heart & Clubs”. “Play” option is used for spinning the reels. “Autoplay” can be used for the spinning the reels and that too without any interruptions. The symbols of this Owl Eyes slots include a badger, owl eyes, mushrooms, feathers, full moon, the tree having a face and symbols of a high card. The wild symbol is the owl having yellow eyes and scatter symbol is the full moon in a night sky. The lower values are K, J, Q, 9 and 10. The wild symbol will substitute for all the other symbols leaving only the scatter. It can land only on the reels 2, 3 & 4. When the wilds will be stacked on the reels, the players will get more winning opportunities. If the wild symbol is a part of a winning combination, the win will be multiplied by 2. In order to get the Free Spins feature triggered, at least 3 scatter symbols should be landed on the reels. Hitting 3 symbols will provide you five free spins, 4 will give you twenty free spins & five symbols will give you hundred free spins. The total stake will be multiplied by all the scatter wins. More stacked wilds are also added to reels. Using the Gamble feature, your wins can be doubled or quadrupled if the colour of the card is guessed correctly. Making a wrong guess can make you lose everything thereby taking you back to the base game. Only 5 picks are available in this feature. By just turning the new leaves, you can be awarded up to 500 times the stake amount. Badgers are quite difficult to spot so keep looking for them as landing 5 badgers will give you 800 times the stake. Find a family of living trees which live together, and you will be awarded a marvelous 1000 times your stake. 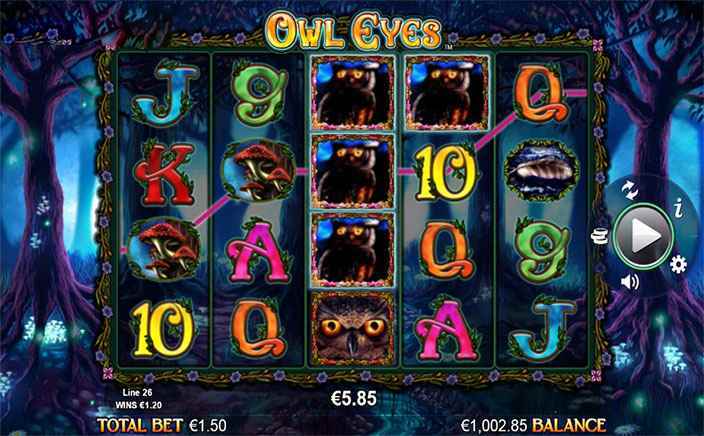 Owl Eyes slots makes sure to give its players a thrilling experience. This slot has pleasant graphics & animations. Well, if you are looking for some big wins keep looking for the free spins. So, enjoy spinning the reels of Owl Eyes slots.